One of the most important, and oftentimes overlooked steps in the coffee making process is the coffee grind. Over grinding or not grinding enough can make or break the bold and rich taste that coffee provides. Though it may be simpler to buy pre-ground coffee, the quality will be nowhere near to that of freshly ground coffee beans. Thus, it’s important to understand the proper coffee grind required for different brewing methods. In this article, we’ll discuss the best grind for coffee makers with a coffee grind chart. Each brewing method requires different sizes of coffee grinds. Here’s a coffee grind chart showing the best grinds to use for a French press, pour over, siphon, stovetop espresso, and Turkish coffee maker. Making coffee from a French Press requires a coarse, even grind. A coarse ground will look somewhat chunky. Because the coffee is steeped in boiling water, the contact time between the water and coffee is much longer, which requires a coarser grind. Grinding the coffee too coarse will make the coffee weak. Grinding too fine will make the coffee murky and taste bitter. For pour over coffee, the best grind to use is a medium-coarse grind. 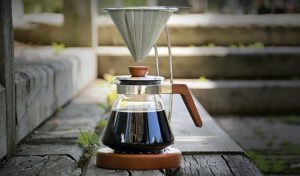 A medium-coarse grind will be similar in size to a French press grind but less chunky and will feel slightly smoother. If you are using a cone-shaped pour over, then use a medium-fine coffee grind instead. Since there are many different pour over brewers, each one will need a slightly different grind. You may need to experiment a bit more with this method until you find what tastes best for you. Keep in mind: the less time the water is in contact with the coffee grind, the finer the grind should be. Siphon coffee requires a medium grind size between filter and espresso but closer to the filter size. Siphon coffee makers typically use a cloth or metal filter, producing a full-bodied and clean cup. You don’t want the grinds to be too fine that they’ll clog the filter and you don’t want them to be too big. If the grinds are too big, flavour will be lacking as it is a quick brewing process. 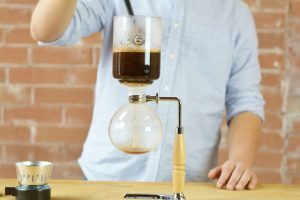 Learn how to make siphon coffee. For stovetop espresso makers, use a fine coffee grind. A fine grind will be similar in size and feel to that of sugar. It should also be slightly coarser than a grind used for a regular espresso maker. Fine grind is required because of the short time the coffee grind comes in contact with water. Pressure builds up in the espresso maker which forces the water through the fine grinds. If you were to use a coarse grind, the water would not be able to extract the flavour from the beans. Due to this, espresso is the most sensitive of coffee types when it comes to the size of the grind of coffee beans. If the grind is just slightly finer or coarser, it can drastically affect the end taste of the espresso. Turkish coffee is essentially very strong coffee with fine grinds in it. Based on that description alone, it’s a no-brainer that this kind of coffee requires an extra fine grind. To give you an idea of size, the coffee grinds should resemble powdered sugar, making it even finer than what’s used espresso. The grinds need to be so fine that some grinders can’t even accommodate Turkish coffee. So when you’re looking for a coffee grinder, make sure it has the proper settings should Turkish coffee be your coffee of choice. The best coffee beans to use for making coffee are fresh beans. Grinding your coffee beans right before each brew will make for a much better tasting coffee. If you don’t already have one, you’ll want to get yourself a burr grinder for a better tasting coffee each morning. 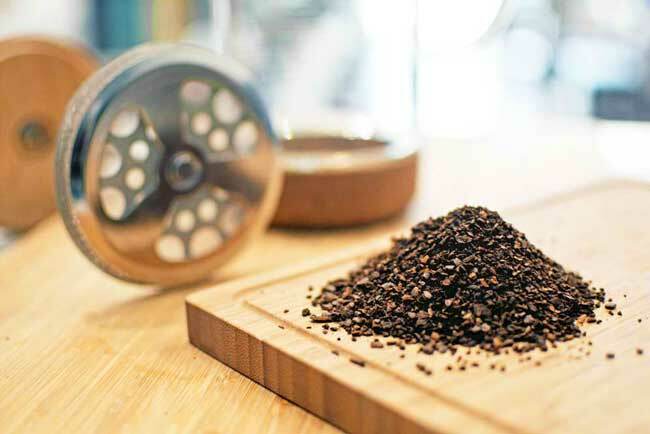 Though a burr grinder is more expensive than a blade grinder, a burr grinder will create a better quality grind. This is because burr grinders are much more versatile and precise. They are versatile because they have different settings for grinds from extra coarse (for cold-brew) to fine (for espresso). Therefore, you can use one grinder for any kind of coffee. They are also much more precise than blade grinders. Burr grinders create a much more even grind size than blade grinders, which makes for better coffee. More consistent sizes in the grind will provide better control of the flavor extraction from your coffee maker. Whether you are using a French press, pour over, espresso, or another other method, burr grinders are the better option to choose. Though blade grinders may be more simple and convenient, burr grinders will give you a much higher quality coffee. So now you know what grind is best for your preferred style of coffee. Remember that the grind size you use is what separates a rich, flavourful cup of coffee from a bitter cup of water. 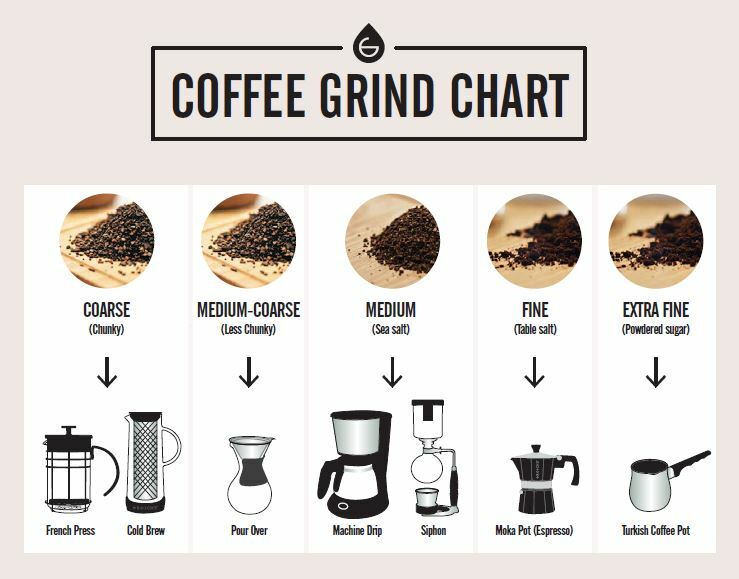 Hopefully, with this coffee grind chart, your next coffee will taste better than ever. And don’t forget to check out our grinder and coffees to spice up your next cup!